"OF the 616,329 hectares of the Department of the Somme, are counted in round numbers: Tillable lands, 488,000 hectares. . . . The Somme is one of the best cultivated department's of France. . . . The sugar beet is the principal crop of the Santerre and of almost all the arrondissement of Péronne." Thus our region is described in Joanne's "Géographie de la Somme," before the war. In his Report on the economic condition of the Department on August first, 1918, the Préfet states: "The invasion caused a loss to the Department of 27 percent of its territory in 1914, and, to mention only the principal crops, 40 percent of the total harvest of wheat, 30 percent of oats, 60 percent of sugar beets, 20 percent of fodder beets, and 18 percent of potatoes. The mere enumeration shows to what an extent the agriculture of the Department was affected at the beginning of hostilities." But however great the disaster, it was matched by a courage as great. "The huge shortage created in the world of agricultural labor by the mobilization of the 25,000 to 30,000 cultivators or field workers of the Department, came near being fatal to agricultural production. It is thanks to the admirable steadiness of the rural population, in remaining in its homes, that we owe the conservation to the country of the. greatest part of its economic power. Justly and often, the energy, the indomitable courage of the wives of the soldiers who have taken upon themselves the labor of men, have been placed in relief. In the Somme, as in the other departments, the country woman has shown herself equal to her task, and has compelled the admiration of the State. In addition, aged farmers who remained on their property and who in time of peace would have abandoned themselves to a well-earned repose, have set themselves once more to work, aiding or guiding the young people who have become amateur laborers, drivers and producers on every hand." We and the other relief societies were in the devastated area to answer in some sort the needs of this brave population. But how? It is characteristic of the patient courtesy of the French nation that they have never offered their Allies advice. The broad outline of our own relief work had been made in America. There were the two doctors, one a Johns Hopkins graduate, and her assistant, who converted her internship into service in the devastated districts of France. In lieu of trained nurses, who were naturally in the greatest demand for the American Expeditionary Force, three of our number acted as volunteers. There were women skilled in children's work, carpentry and handicrafts; one was a farmer, one was a high-school teacher; six were trained social service workers, and six qualified as chauffeurs. Our efforts fell then, into five main divisions, public health, stores and supplies, farming, transportation, and social service proper with its three sub-divisions of visiting, sewing and child-welfare. For the first six months a unit of eighteen carried out this program. Of these, two deserve special mention, as not officially members of our body; our housekeeper, Mrs. Roberta Cummings, a volunteer Red Cross worker; and our buyer of supplies in Paris, Mrs. Hannah D. Andrews, who became our Director in January, 1918. The doctors, as has been said, were the first to begin. A doctor's bag was their main reliance, since boxes of medicines failed to come through. This meager source of supplies was augmented by the kindly coöperation of the military doctors of the region, and later, by a generous grant from the American Red Cross. Their base of operations at headquarters was at first a corner of the orangerie, which they shared with carpentry classes, gymnastics, and social gatherings. The orangery was also our garage. To make the rounds of approximately five hundred patients, they had their allotted share of transportation, with additional service, whenever possible, for emergency calls. They had also Tambour, an ancient horse detached from the artillery, a high two-wheeled cart, and a soldier in a brave new uniform, to drive. These last were a gift from the Sous-préfet at Nesle. But, most frequently, the Unit will recall our doctors, of a Sunday morning, or perhaps of a bitter afternoon, knapsack on back, starting cheerfully away on foot. Cheer, in fact, was their main stock of medicine. A boche baby was a baby, to be brought into the world as tenderly as any other on a winter's night. A gaunt-eyed child, lost by day in the bed where all the family slept at night, smiled over her first doll, bought with infinite care at Ham. Candy, hair ribbons, and more practical but perhaps not more efficacious, toothbrushes, beguiled the youngsters into habits of cleanliness. Then, too, there were fairy tales such as four-year-old Noël and 'Tásie had never heard in their war-invaded homes, of the little Love, si petit, si petit, si petit, of the big bear, the little bear and the bear of medium size, and of the fish and the fisherman on the shore of the sea. Catechisms and hymns belonged to this delightful pharmaeopæa as well, for Dr. Kelly remembered the France of her own childhood. However, medicines and bandages had their place, particularly after the dispensary was installed, by the nurses themselves, in one of the portable houses. Here reporters were prone to take pictures of the medical department in action, under some such caption as: Red Cross Doctor and Nurses of the Smith College Unit Binding up a Shrapnel Wound near the Front-,--the patient in this particular instance being Marie, who was suffering from that malady most common in our neighborhood, a carbuncle. Here, one day, such was our fame, an ambulance load of sick French soldiers drew up, under the mistaken impression that we were a military hospital! The dispensary was open officially six days in the week, and on Sunday was never quite shut. In addition, medical rounds were made in all the villages each week. In three villages, there were permanent dispensary quarters. All medical service, medicines, combs and toothbrushes and supplementary feeding such as eggs and milk from our cows, were free, to give the fullest encouragement to healthful living. In spite of the shortage of pumps and fuel everywhere the results were striking. One scarcely recognized the clean---though often ragged---children of 1918, as those who had watched so listlessly our arrival six months before. Even a sojourn in the hospital, that bugbear of mothers and children in other districts than rural France, was made by our doctors into a joyous adventure. The hospitals were not our own. One was located at Blérancourt, fifteen miles away, under the auspices of the American Fund for French Wounded, and a second was opened in Nesle in November, 1917, by the American Red Cross. The doctors tell of a forlorn baby who was crying all night and keeping the mother awake, whom they finally took away. "And then, the mother came and complained that she could not sleep because she missed having to get up with it!" But that same baby, and every child-patient who went to Blerancourt, came home with a trousseau of new clothes. They talked for days of clean white beds, and kind ladies, and a wonderful journey in an automobile out into the wide world. Our store was our most picturesque and perhaps our most useful method of distributing actual relief. We cannot however claim the idea, because the English Society at Nesle had such a store in operation before our advent. Like most of the societies, they, and we, felt that the population should not be pauperized by too generous giving. The Government supplied a pension with the intention that it should be used to purchase necessities. It did not give outright even such articles as farm animals, tools or furniture, but issued them chargeable against a further indemnity to be paid to the victims of acts of war. We conformed to the Government plan in selling our small wares, though at a much reduced price. This system, we found, was quite readily understood by our villagers, because the Belgian Relief Commission had used it in these same villages when they lay behind the German lines. The stocking of our store began in Paris, and was continued in Noyon, where Baron Rothschild, attached to the Service de Santé, had inaugurated a number of sewing circles, or ouvroirs, for the destitute women, and placed on sale the finished garments. In addition, he carried soap, groceries, kitchen utensils and miscellanies, at cost. In those days the old Bishop's palace, which had housed one of the most powerful lords of the church in feudal times, was a plebeian but cheerful spectacle! To it, we made a weekly shopping trip. At the same time, our buyer bought tirelessly in Paris, and sent the goods up through the army by rail to Noyon, and thence by army camion, to us. In this way arrived the assorted stock of a country emporium. But we seemed to deal chiefly in galoshes such as, we are told, the ancient Gauls of this region wore in the mud of Caesar's time. Galoshes, being indigenous, came in only one style of leather tops and clog-like wooden soles. Sabots, on the other hand, were subject to fashion; nor could we persuade our peasants to wear the all-wood variety of Brittany; they favored patterned leather tops. Another great source of our supplies was the American Red Cross, which allowed us to use our discretion in selling their donations if purchased by them in France, though, owing to customs regulations, we could sell no imported goods. In spite of the rapid turnover of stock---for we had a fixed store at Grécourt three days in the week, and took the road with the White truck as a peddler's cart the other three---storage space presented an acute problem. Up to March, 1918, when the last of the poor villagers of Grécourt moved from the basse-cour into the shacks set up on their ruined farms, our store room was the cellar of the Château. At best, the light there was dim, becoming inky with the swift-falling winter nights. Repeated cleaning dislodged only surface filth, which seeped in again. The dampness ruined many of our supplies. The cold seemed to congeal all effort. And yet, from early candle light till late, the cellar was the scene of Unit activity. Here in a donjon Mme. Topin chopped and sawed our wood; here came the dairy maid with her warm pails, wary of the low lintels; here the housekeeper penetrated to the meat-safe; here camions disgorged their cargoes, including thrice-precious coal, gasoline and oil. Here, in short, the Unit centered. But when the truck, full-loaded, swung out of the gate, across the moat, and away, youth and laughter were aboard. If, in after years, the Somme peasants forget the full measure of their grief and those who mourned with them, they will never forget, I feel sure, that flash of color, that ripple of mirth along the somber roads,---the Unit's traveling store. Honk! Honk! What is that sound in the village street? From cellars, chicken-houses, shacks, patched cottages, from every nook and cranny, race the children to climb on the running board, and sing the progress to the square. Here come now the mothers, shawls over heads, baskets in hand, chatting together while the storekeepers open hampers and boxes, hang up the tinware and display their goods. Lively questioning ensues, with approving nods at the prices quoted. One urges another on; some have commissions from stay-at-homes. The money is easy, the sales are brisk. It is like the old-time village fair! Soldiers billeted in the village pause and join in the chaffering; and the storekeepers presently add men's shoes and a certain amount of haberdashery to their weekly orders. Où est la reine Margot, au gai, mon chevalier?" Elle est dans son château, au gai, mon chevalier." But games and sewing are not all; there are books to be distributed, books collected on the quays in Paris, in musty second-hand shops, from book supply houses, from charitable donors, for children's books became scarce in France in the years of the Great War. These, catalogued and covered with stout paper, go out now to rejoice the villages, where the grown-ups read them too. There are magazines also of current events, fiction and fashion. For a week they will be loaned, and replaced by others at the end of that time. But, like all our activities, the children's committee had its headquarters at Grécourt. Here on Thursdays of each week---the holiday of the French school---came all the children within walking distance who wished to come. And who did not? The difficulty was to keep out the overflow of Ercheu and Moyencourt, who trooped in the back way over the meadows and through the woods. Alas for the day! they belonged to the Secours d'Urgence and not to us. On Thursdays, serious work went forward. There was the children's clinic in the dispensary, graded sewing classes for the girls, carpentry classes and clubs for the boys, games and gymnastics, and often a party for all. The carpentry classes excited much emulation. In them we made benches and tables and shelves for the schools, opened with practically no equipment, in bare shacks or dingy rooms. After the needs of the school were attended to, the boys set to work with even more enthusiasm on rough furniture for their own equally bare homes. The clubs were a new idea in most of the villages, and the simple insignia, designed by the boys themselves, were worn with pride. It was an entering wedge against the restless habits of three years without regular schooling, three years of military occupation, of the excitements and hazards of war. The girls' sewing classes, like the boys' carpentry classes, were designed to supply needs in the homes. 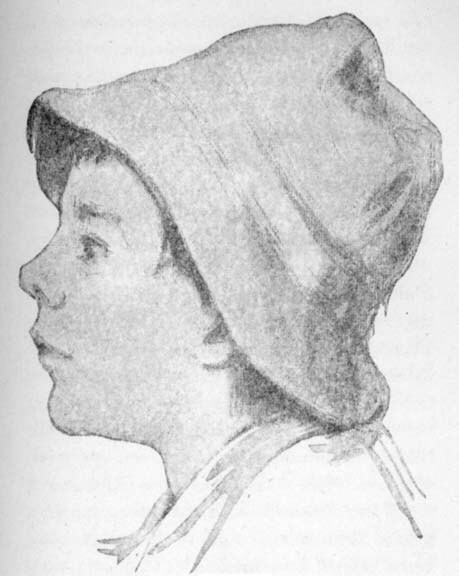 Most of the girls had deft fingers, and much of the work begun in class was finished at home. In two villages, where there were as yet no classes in school for the girls, sewing clubs for which we supplied the materials were placed in charge of the teacher. As for knitting, no teaching was necessary to make the stout ribbed stockings of which every one had need. These two industries were by no means confined to the children. One member of the Unit had charge of sewing and knitting throughout our villages, and supplied material, cut into garments, to forty women. The price paid for the making was that fixed by the French Red Cross, which had large work rooms in Nesle and in Ham. Our women, being field workers, were most of them not expert with the needle. They undertook the sewing during the winter more for occupation than for anything else. All the garments returned went into our stores, to be distributed in relief, or sold. The basis of charitable giving, with us, as with any relief organization, lay in investigation of family income and needs. We had our visitors, to each of whom was assigned one village, a method already worked out in conformity with the marraine plan by the American Fund for French Wounded at B1érancourt. But we went into our homes in the ruins with a very different point of view from that of the professional charity worker of the slums. Slums our villages might be. Eppeville, the poorer artisan quarter of Ham, with its population of migratory refugees, here to-day and gone on their way to-morrow, was a case in point. But the majority of our poor had been prosperous, industrious farmers. Their embarrassment was temporary only; they were not to be classified in cold blood in a statistical survey. About their poor tables, beside their hearths, we sat and chatted over cups of coffee, or steaming bowls of soup. Theirs was a problem in economics, not in charity. Hence, the end of all our effort was to stimulate normal communal life and industry. If there was a blacksmith without a forge, and a continuous stream of travel bound to require repairs, it was our duty to get the forge. If a community entitled to a shack for a school was not receiving it, we called the attention of the proper authorities to this oversight. If there was a grocer by trade, without a stock and with no means of transportation, we bought for him and delivered. If there were supplies of fodder, of hay, or of vegetables in storage in some barn, we paid for and consumed them, putting money in circulation. Such were the obvious means of alleviation at our command. In line with this was our introduction of livestock for the purpose of supplying the people, and our agricultural program which was of prime importance in this farming country, and which developed with the spring into our main line of effort. As for the habitually indigent, they were in a minority, and were known, as they would have been at home, in all the Mairies and to all the teachers, who are in France, ex-officio, the mayorial secretaries. Thus in every village a committee stood, ready-made as it were, to help us. Despite the war, the mayor's lists were models of accuracy and neatness, his comments, or more frequently those of his wife, full of sense and human nature. Or, did they appear biased, there were enough country families of prominence with whom we might advise, to correct his judgment. "When people have been through the experiences which befell the inhabitants of the devastated regions during the last three and a half years, I think we may safely deal with them in a somewhat more generous manner. . . than would be the case in ordinary relief work at home." In 1917, the spires of our churches were for the most part fire-gutted skeletons; in none of them pealed the Christmas bells; in none of the edifices were held the midnight masses so dear to the devout villagers. Yet 1917 marked for the Somme villages the Christmas of the Liberation. What though the moonlight flooded the plain, and made a target of half demolished ruins for German aviators, so that the Bishop of Amiens was constrained to forbid the midnight service? At least the Germans no longer sat at their firesides, or set up their laden Christmas trees, or celebrated in the churches the Te Deums of their victories. At Nesle itself, the occasion was marked by ceremonies as brilliant, as moving, as any in her long history. M. le Sous-Préfet gave there a party to a thousand children, gathered from the town itself and from near-by villages. He presided in silver-braided uniform, the Army assisted in gorgeous red and gold and blue; French ladies of noble family hid their identity in the graceful veils of the Croix Rouge; the British of the uvre Anglaise, and the Americans of the Smith Unit, came in khaki and in service gray. But the children! They sat with mothers, grandmothers or grandfathers in that dingy hall, listening with all their ears to the grave, gracious Préfet, to the opera singer of Parisian fame whose croix de guerre scintillated at every breath, and looking with all their hungry eyes at the candled Christmas tree. For each child there was a present and a goodie, and a smile from the Sous-Préfet, who had brought his own family with him to Nesle. To their elders went a card from the Secours d'Urgence at Roye, bearing a picture of de Roty's "La Semeuse" and inscribed: "To those who have no longer houses or gardens or sanctuaries, whose very soil is tossed by the storm of fire and sword-to them we send thee, swift-footed Sower. "Their eyes are filled with the sight of ruins, but there remains to them the love of their land and their faith in work. Go, tell them that they axe not alone. France is there, her noble Allies are there. The houses shall be rebuilt, the gardens shall flower again. The grain shall ripen once more in the furrows. We have not come to the end of plowing and planting, loving and hoping. A breath of righteous anger and liberating love has passed over the world. No crime shall rest unpunished, no one shall have suffered in vain." We too had our Christmas fêtes, a week of them, for each of our villages. Shopping began early on both sides of the Atlantic for six hundred children and a thousand adults. The College clubs in America sent us lists of the contents of generous Christmas boxes, but we on our part knew that these boxes would probably never arrive at Grécourt. So to Paris went shopping orders compiled from the lists given us by our mayors and annotated by our Christmas committee. There were wholesale orders of mittens, capes, stockings and warm underwear, as well as of toys. Besides purchases, there were ample Red Cross donations, donations from M. le Sous-Préfet, and from M. le Commandant at Guiscard. Some of the articles came from Noyon, and others, including the bags for candy, were made by our own women in the villages. But even so, as the week of our fêtes drew near, there were unexpected demands to be met. Early falling snow threatened to retard shipments from Paris. A shopping trip in our own truck to Amiens was therefore decided on and carried out over the bleak and drifted roads. Vient à nous du ciel. Born is the King of Israel!" On Christmas Day itself, however, the Unit was at home to its countrymen. There were American soldiers attached to French or British commands in our vicinity. There were our colleagues of the American Red Cross, and of the Friends. There were our rescuers of a memorable night of fog and perilous driving--just as good as Americans,"---the Canadian foresters. All these and any chance acquaintances of our side of the Atlantic, we invited to Christmas dinner at Château Robécourt. Our great hall was doubtless no colder than that in which the Marquis of Nesle used to welcome his retainers, for those days, like ours, were lacking in window glass. In lieu of the Yule log, a monstrous German stove, luckily unearthed, heated one end of the orangery. From the lofty ceiling depended lanterns festooned with Christmas greens; loops of mistletoe and holly were caught in place along the walls by sconced candles. The table was heaped with turkey, cranberry and steaming potatoes. There was a fragrance of hot coffee which was served with real cream. Our guests, from a radius of thirty miles, numbered about seventy-five. They ate and danced and sang with war-time zest. Yesterday, to-morrow made as it were a spotlight of the present, and this was Christmas night. A few days later, the orangery was again the scene of a Christmas gathering, our fête to Grécourt, Esmery-Hallon, Hombleux, Bacquencourt and Buverchy, our nearest villages. There were distinguished guests at this party also, and one of the treats which M. le Sous-Préfet brought were tarts of white, white flour which he dad commanded to be made for our children by the bakers of Nesle. But the parties which were most memorable were those held in the distant villages; in Canisy, with an air battle taking place overhead; in the bleak ruins of Douilly, in Sancourt, where the sun went down blood red across the snow; in the soldiers' theater of Offoy, scarfed with the blue smoke of open braziers. There the Colonel of the regiment and the Mayor of the town united their gifts to ours. For the Colonel had sent one of his captains to Paris, where the captain's wife had, according to orders, spent many days in shopping for the children. And yet, the fête,---it was ours. To the Colonel we owed also the military chaplain who celebrated the Christmas masses, and his friend a young corporal who accompanied us everywhere, to lead in the singing or to do any service that we would allow. Cold, desolate, and yet how happy, were those Christmas fêtes, never to be repeated, of 1917. 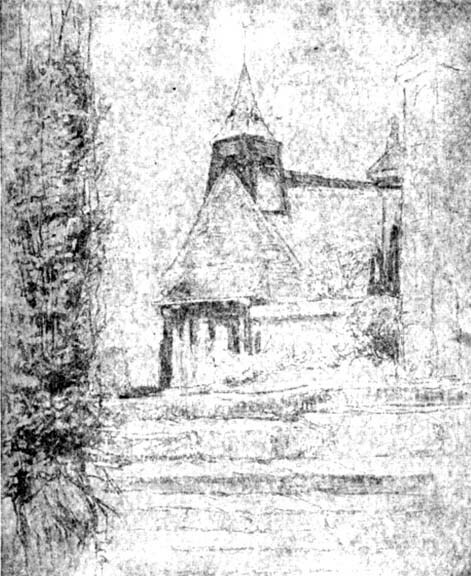 No, never to be repeated, for 1918 brings the picture of another Christmas, a refugee Christmas, for the exiles of Grécourt in a farmhouse at Rambouillet, a hundred miles away. It too was a Christmas of the Liberation, for the Armistice was already six weeks old, the hated invader had left the soil of France, their own villages in the Somme were free. To fulfill their happiness, fathers had come back from slavery with the Germans, and husbands from the colors. But the intervening year had held its ultimate sacrifices, the second flight of the villagers before the enemy, the dispersion of kinsfolk, some of them never heard from, the suspense when the fate of the world hung in the defense of Noyon and of Château-Thierry. Alas! into the breach at Noyon was thrown the regiment of the Colonel of Offoy, in repose at the moment. There, like many another, fell our friend the corporal. THE new year of 1918 opened with momentous changes in the Somme. Even before we reached Grécourt, rumors had been current of the "Allied offensive," and of the extension of the British lines toward St. Quentin. These lines, pivoted on Amiens, ran westward to the Channel, and eastward as far as Chaulnes. Many a time on our trips up from Paris, we went by Amiens, changing there for the little train that ventured on to Ham, and many a time have we ridden with the Tommies, who stumbled out of the unlighted train into the darkness at Chaulnes. Already in November the advance police from British headquarters came down to investigate our reason for existing in the War Zone. They told us even then that our presence might be unwelcome to their Army, the policy of the British being opposed to civilian workers of a semi-military rating, and particularly to women workers near the lines. In January the long-expected extension of the lines took place. By the hundreds of thousands, the trenches to the north and east emptied themselves in blue-flowing arteries, coursing, day and night, down the Somme valley, to destinations to us unknown. Cavalry, commissariat and artillery, dented and camouflaged, passed with a hollow rumbling that shook the frozen roads. The aerodrome in our rear, where but a few days before dozens of new planes had lain, like butterflies with poised wings, ready for flight, swarmed overnight. The gypsy vans of the homing doves ---strange birds of peace in the midst of war---joined in the exodus. It gave one a wrench at the heart to see that rearward movement, to see our Army go. Nor were they immediately followed in our sector by their successors. One wondered who was holding the lines. And then, they came down those same roads, the Fifth British Army, a solid dun-colored stream. They overflowed into our villages and took up the quarters the poilus had left. Their officers, correct and spotless, came to call. Their Headquarters at length recognized us and allowed us to remain. To this desired end, the Sous-Préfet contributed with his request for our presence, and his testimony to the value of our work. He too remained, as did all the civil authorities. In fact, as the days passed, we found that we had only exchanged the coöperation of the French army for that of the British. But an unforeseen handicap was a restriction of circulation, rigidly enforced. It caught us just at the end of our first six months of service, when a third of our number went home and were replaced by fresh volunteers. These latter were detained in Paris by the ruling that no new workers could be admitted to the Zone, so that our force at Grécourt was reduced to eleven. And this at the opening of spring, for which we had planned all Winter the plowing and the planting and the community centers, undertakings impossible during the inclement season. Another change affecting our status was our formal transfer from the American Fund for French Wounded to the American Red Cross. This step was in accordance with our plan when we left America. It was important in that it gave the sanction of the American Red Cross to a college unit. Other units, equipped by women's colleges, were quick to enroll under the Red Cross and to follow us to France. But here again we were entangled in red tape which nearly stopped our circulating at all. Our cars, of which we had four at this time, had to have new permits; in short, they must be given new military numbers under the American Red Cross. Nor could they receive them by proxy; they must go to Paris. And once in Paris, they came near never getting out. But it may as well be confessed that the Smith Unit has seldom allowed itself to be trammeled. If it had permits, well and good; if it had not, it was something like the American ambulances on the road from Verdun. On its errand of mercy, it too passed. Not that it evaded so much as persuaded. A clear conscience and a good cause usually won a way. But the most serious anxiety of the Unit at this time was due to the fact that our two doctors were among those who left us, and that the doctor who came to replace them was held in Paris. Practically no medical work was possible for us. This want was partially met by the personnel of the Red Cross Hospital at Nesle, and by the coöperation of the military authorities, always vitally interested for their own protection in public health. To the Sixth Engineers of the American Army stationed at Voyennes, we owe special thanks for their surgeon. The needs of our villages for shelter and for furniture were still emergent, owing to slowness of transportation, and the Unit was still delivering blankets, mattresses and beds. But the early spring, which carpeted our grove with anemones and violets and welcomed back the nightingales, brought relief from biting cold. It brought also the season of agricultural activity. A grant from the Red Cross and a trip to Amiens yielded us two plows. Others were borrowed from military dumps where broken farm machinery was being assembled and repaired. Horses and plowmen came from the British army, which like the French army--and like the German---carried out an extensive agricultural program. The plots we selected first lay in Grécourt, Bacquencourt, Canisy and Brouchy. They were of too small acreage to be worked by the army tractors, and yet too large to be worked---had labor been available---by the spade. Yet such holdings sown to wheat would total as much as the broad acres of the propriétaires. For, in Picardy especially, the adage of "no land without its seigneur" has come in modern times to mean no land without its owner. Renters of property are comparatively rare, and the farms once acquired by the peasantry have been kanded down, with ever more minute subdivisions, from father to son. In fact, the first and by no means easy task of the farm committee had been to locate these holdings, from which the Germans had removed the boundary marks. It was in February, with three teams of horses, that the plowing began. Seed wheat was supplied by the Government through the Ministry of Agriculture, but there was no adequate provision for vegetable gardens. These, however, were universal, from the bottom land gardens of Canisy which formerly supplied the markets of Nesle and of St. Quentin, to the kitchen garden of each cottage. Seed for these the Unit undertook to furnish. A notice was posted in every village, and in some the town crier rang his bell and proclaimed, that the ladies of Grécourt would come on a certain day to take orders for seeds. The response was enthusiastic; the women crowded, lists in hand, about our automobile. And such lists! The French are past masters in classification as well as in intensive gardening. There was to be chicory, but it was to be curled; carrots, but short, medium or long, and lettuce, as one of the Unit put it, "for more seasons than we ever knew existed." Flower seeds were not forgotten. As for potatoes, a carload was ordered through government channels. In March, the Unit received its seeds in bulk. Every dish and pan and every member were requisitioned. To sort and do up the packages in grammes was a task like that of sorting a roomful of needles such as one reads of in fairy tales. But at length it was completed; the hundreds of allotments were ready for delivery on the twenty-first of March. For this same date was set the opening of the Library in its own quarters, which the Tommies had helped to fit up. Seven hundred books stood on the shelves; there were games and tools which could be borrowed as well; there were a phonograph and a cinema. Painted tables and chairs, flowers and bright colored curtains made homelike the first circulating library in the Somme. Community centers in three villages besides Grécourt were also a development of the spring of 1918. One was at desolate Douilly, where a social service worker was planning to live, one at Canisy and one at Verlaines. These latter were primarily for the children, and were in charge of two kindergarten teachers. Canisy, with a war population of fifty children, had had no school since before the German occupation. Verlaines, an appendage of Eppeville, had nominally been more favored. But practically it was crowded out in the poor makeshift of a building. Nor was there any kindergarten. Manual training for the boys, first aid, sewing and cooking for the girls, were taught in both these centers. At Canisy regular class work in English for the older pupils and story hours for the younger, were added. At both Canisy and Verlaines, children's gardens with prizes, were to be a part of the curriculum. In both, the children themselves cleaned and whitewashed and hung curtains in the rooms and made most of the furniture. One hundred and eighty children attended in February. Whether by the force of example, or by persistent following up, or both, the public schools themselves improved steadily in equipment during this period. Desks, chairs and blackboards began to take the places of rough tables, benches and a strip of black painted wall. School baraques neared completion; even Canisy saw the Moroccans lay the foundations of its school. The Unit shared the good fortune which seemed to brighten the future of the villages; its own living baraque, long-promised and long-lost, at length arrived. Then it rejoiced in a dining-room and a kitchen under the same roof, in a butler's pantry, and a living-room. There was a work room for the sewing, which had grown to a considerable industry; there were to be a carpentry shop and a gymnasium. At last the stables were evacuated by the happy villagers of Grécourt, whose baraques stood trimly on the sites of their ruined homes. 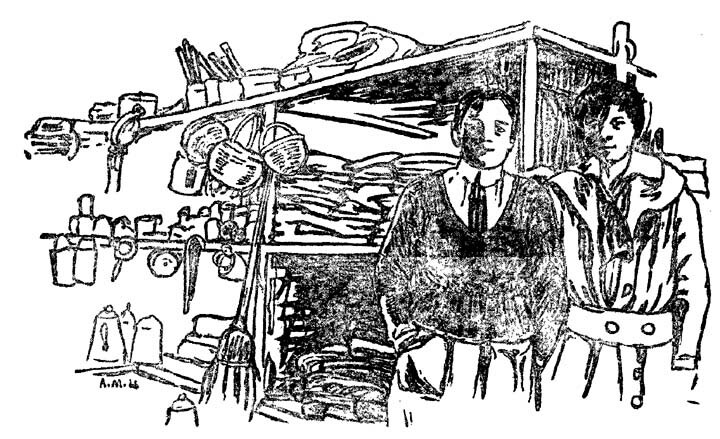 At last the miscellaneous assortment of supplies in our cellar, the soap which turned to suds, and the sugar which melted to syrup, the moldy shoes, the rat-eaten clothing, were transferred to those same stables in orderly array. And at last came the twenty-first of March and the Kaiser-Schlacht of the Battle of Picardy. The Unit, keeping kindergarten, sorting seeds, unpacking boxes of crêpes and toys which had just arrived from Japan, heard that offensive begin. But it had lived long on the edge of danger, it felt safe in the shelter of the British army, it had learned to discount rumors, even the recurrent rumors of the German advance. What though the baraques shook with the impact of the terrible barrage? The seeds must be sorted, the gifts for the children must be ready for Easter, the work must go on. That night the good sense of the Unit seemed justified; the cannonading died down. We went to bed not knowing that the German hosts were again on the road to Paris and only ten miles away. No whisper of breaking lines came through to out-of-the-way Grécourt. Nor were the villages themselves warned. By forced night marches, in absolute silence, 580,000 men had been massed on the St. Quentin front. Opposed to them was the Fifth British Army of 170,000, whose lines of defense even had not yet been consolidated. Shielded by a dense fog, the Germans crossed No-man's-land. They fell on the British trenches. By the morning of the twenty-second, word reached us through the Sous-Préfet and later through a British officer, that the Germans were approaching Ham. The cars went out in haste at the news, to help in evacuating our villages. One went to Ham itself for gasoline, one to Verlaines, where the entire population was entrusted to us, and a third crawled through the congestion of choked roads in an effort to reach Canisy. Beyond Ham, Offoy, Douilly and Sancourt were cut off. We heard afterwards how M. Vernes and M. Quellien, reckless of danger, raced the Germans in a high-powered car, and rescued the populace by a special train which pulled out in full bombardment. But by the time we were warned, Canisy was being shelled, and there was no escape. There remained the refugees from Esmery-Hallon, Hombleux, Buverchy, Bacquencourt and Breuil, who began to stream on foot or in wagons toward Roye and Montdidier. For the German advance, sweeping almost to the gates of Amiens, quickly overran the railroad. Our own village of Grécourt was slow to leave its new baraques, its freshly planted gardens, and its furnishings so lately acquired. We ourselves staid. British troops, exhausted, straggled by dozens and by hundreds toward night through the gates of the Château. The Unit's first canteen began with them. Hot coffee was served until after midnight. A breakfast was left ready on the stove for the morning, and clean dishes set out for the meal. Meantime, the cannon were deafening, big British guns emplaced in our fields adding to the clamor. Our cows had been sent on in advance; our other belongings were entrusted to the British, to be used, or, as a last resort, to be destroyed. The cars were overhauled and stowed with a in eager assortment of duffles, suitcases, blankets and food. The records, the pure bred poultry and Fury, our pet dog, were also to be evacuated. At dawn, the crackle of mitrailleuse could be heard distinctly. The major in command at Grécourt warned us to be off. "And so, in the faint gray mist---that mist which had been so fatal to the British Fifth Army---we rolled through the gates for the last time," and took in our turn the refugee road through Roye to Montdidier. But our usefulness did not end with our flight. Under orders from the French Mission attached to the British Army, our four cars scoured the country. The old, the feeble and the new-born, our own villages and dozens of others owed their escape to us. In Montdidier itself, we took charge of the embarkation upon the refugee trains. The scenes were heartrending, families scattered, sacks and furniture and animals saved thus far abandoned for lack of space. Here too we set up canteens, to which the American Red Cross and the Quakers contributed their stores and their personnel. For all the relief organizations driven out from our sector met in Montdidier. By the following day the Red Cross authorities from Paris had come up to direct the retreat for their own units, of which we were one. Accordingly five of our number were ordered to Amiens. But Amiens that night suffered the most severe bombardment of the war, and the next day the Red Cross joined in the general evacuation, heading for Beauvais. Meantime, Montdidier was being given up. "There was almost panic in the air," reads one of the Unit notebooks. "People were fairly tearing to the train with their carts and wheelbarrows of baggage." But "when we left the hastening streams of évacués and army traffic in the streets and went into our hotel for dinner, we seemed in another world. The proprietress had laid the table most carefully with clean linen and the choicest crystal and china she owned, and lighted it with candles. She waved her hand toward it with pride. 'Voila,' she said, 'it is thus the Boches shall find my house when they enter it!'" Other pictures this notebook has, of a British major in charge of a detachment in a little village just coming within range of German bombs, "strolling around with his pipe in his mouth and an air of being bored in general, who insisted on having bacon, fried eggs and coffee served to us." On every page, in every account, is testimony to the wonderful nerve of the British, both officers and men, during that Great Retreat. "If there was a blunder---which only time can tell---it was higher up, and those men who gave their lives that week should be freed from any breath of blame." Equally unstinted is the praise of the refugees. "I cannot tell you," says one, "how patient and uncomplaining they were." "Among them," writes another, "came Mme. B----- and Alphonsine from Buverchy. And as with the others of our villagers who had been with us at Montdidier, I felt as though each forgave the other all iniquities and there was nothing left but friendship and sympathy." There are glimpses of a distracted mother of nine children, strung along each on a different gun carriage; of hurrying dispatch carriers; of booming batteries. In a certain village the French reënforcements were in position, "and as we went on there was a deafening noise of guns. I was looking around to see where it came from and a French soldier said, smiling, that we needn't be afraid, they were French guns. I allowed I wasn't afraid, but I'd like to see them, so we went up a little road back of the church, and there was a French 155 mm. gun. I wanted to see it fired, so stood by till all was ready, then when they fired stepped back under shelter, for it shook tiles off roofs, made the walls totter and gave out a noise like a thunderbolt, as it leapt up and then sank languidly down again." As for the Unit itself, one member had time occasionally to sight another making soup, boarding trains to distribute food, driving, or "with a blanket full of hunks of bread on her arm, managing traffic with her characteristic efficiency." But for the most part, it seems to have been quite preoccupied. The newspapers in America which featured for a day "the heroism of the Smith College girls" knew better than the Unit what it was accomplishing along the roads from Grécourt through Roye, Montdidier and St. Just to the allied headquarters in Beauvais. In retrospect, it treasures the testimony of the American Red Cross: "They have lost their equipment, to be sure, but they have saved the lives of hundreds of French women and children and old people. Each girl was charged with the evacuation of a village, and each one stuck to her post and rescued her people in spite of shell fire. We have believed for a long time that American college girls were equal to any emergency. We have never had a finer example of their courage and ingenuity than that which this small band of Smith girls has given us. Major Perkins wants more like them in France." OF how the French saved the line at Lassigny, in what Lloyd George called at the time the most wonderful bit of swift military organization the world has ever known, of the bombardment of Paris, of Château-Thierry, of the Argonne drive, it is not the province of this story to deal. In the annals of the war, one comes across occasional mention of the Smith College Unit. It too was there. There, ten miles from Verdun, in the canteens which it had organized for our own army, the Armistice found it on the eleventh of November, 1918. The hush of that truce fell almost painfully upon ears long keyed to uproar, upon spirits taut with excitement. It threw out of employment, millions upon millions of men. It disjointed vast plans, among them those of the American Red Cross, of which we were an infinitesimal part. The magic fabric of Red Cross organization with the American Expeditionary Forces was doomed to dissolution. Within a month, the Unit, save for two members who accompanied the Army of Occupation to Coblenz, was back in Paris, without a job. Yes, it walked the streets of Paris many days, from the offices of the American Red Cross---that house of cards so soon to crumble---to those of the Ministry of the Liberated Regions, trying to learn what were the policies of the hour. Of its own purpose, it was already sure. On the morning of the Retreat, its leader had written to the Committee in America, "Tell every one that when the proper time comes, we will return and rebuild our villages." These villages, which had been freed by the victorious advances of early September, were offered to us once more by the Ministry. We knew, from tours of inspection, that the inhabitants were coming back. In other regions societies similar to ours had already resumed their functions. But as for the Somme, we were told on the one hand that if help did not arrive by January, a whole harvest would be lost, and, on the other, that it would be criminal to encourage a return to their ruins of the destitute refugees. In spite of our previous experience, the problem was a new one to us. In 1917, our villagers bad not been evacuated en masse, to a great distance from their homes; they had saved some things, and their most emergent physical needs had been supplied before our advent. In 1918, they were dispersed to the four corners of France and beyond the border in Germany. They would come back from exile and from imprisonment with only what they could carry by hand, to ruins four times denuded by the successive struggles of opposing armies. In 1917, they could rely upon their own army of occupation for food and labor; in 1918, only upon the civilian authorities, still hampered by military exigencies, and upon German prisoners. In 1917, the liberabon came in the spring, with all the summer of production ahead; in 1918, on the threshold of the inclement winter. But of all the discouragements and problems which faced us, the greatest was the decision of the American Red Cross not to recommission its units of civilian relief. As a part of the American Red Cross, we were not free even to accept the offer of our villages made by the French Government. Back of this decision of the Red Cross were reasons we could not know. They concerned us only in so far as they might apply to any outside agency entering on the after-war field of rehabilitation. Rumors were current that the French did not want American personnel. If so, we were not justified in withdrawing from the Red Cross, or in soliciting money to continue as an independent unit. What was to be done? We took counsel of many, notably of our former official head in the Red Cross, Mr. W. B. Jackson, and of Mr. George B. Ford. The latter, an architect and a liaison officer between the American Red Cross and the French Government, was an excellent adviser. We asked to be released from the Red Cross, and accepted from the French the responsibility of our villages. In doing this, we had throughout the greatest practical assistance from the American Red Cross. Its decision to withdraw its direct agents of relief was made in favor of a larger plan, that of stocking great warehouses at central points in the devastated area, which should be reservoirs of supply and of transportation on a wholesale scale of all relief agencies in their districts. There were seven of these warehouses in the devastated area. From two of them, those at Compiègne and at Amiens, we drew heavily. In addition, the Red Cross furnished us with three new camionettes, so that our transport consisted of our original White truck---of which we are very proud---a passenger Ford, a Ford jitney and the three camionettes, making six cars in all. To this means of locomotion, we added, as we had done in the spring of 1917, the convenient bicycle. "Where nothing sounds but fear and pain . . .
Despairs and Miseries . . . In cries of fear, toward the lost sun. Dun and endless as hate!" But at length, the cars halted in the ruins of Brouchy, whose outlines had not greatly changed. Here there were indeed the children and their elders, a hundred souls in all. Among them some were strangers to us, for they had come from that great tribulation, captivity behind the German lines. But one and all, they welcomed us, asking eagerly when we should return to Grécourt. Passing on to Offoy, which in 1917 had escaped almost unscathed, we found it had been severely shelled in the contested crossings of the Somme Canal. Like Sancourt and Douilly, it was uninhabited. At Canisy, on the other side of the Canal, three men, returned prisoners from Germany, were living in a hovel and trying to patch up homes against the coming of wives and children. At Buverchy, the other extreme of our sector, again the signs of bitter conflict were evident. The Canal du Nord had been fortified by the enemy as one long trench. The fields between Buverchy and Grécourt, Bacquencourt, Breuil and Hombleux had been the theater of struggle about the key of the German defense just north of Hombleux, known as Cote 77. But in Hombleux, thirty-one of our neighbors were already back. Esmery-Hallon, Verlaines, Muille-Villette had their quotas. And when the cars drew up at length at the Château Robécourt, who should be looking out of the one pane of glass left in her window, but the care-taker, our old friend Marie. Not only was she there, but her soldier husband, on leave for the fête, her mother and her two boys. Apparently oblivious to the gaping basse-cour, the breached walls of Mme. la Baronne's garden, the shell holes, litter of ammunition and blasted woods---for here the Germans had emplaced a powerful battery---Marie was at home. "For here," said she, "one has everything---a roof, wood, two fires. it is much better than Paris." And forthwith she invited the cold and hungry travelers in. From the Somme to the Riviera, sunny as its mimosa blooms, was a contrast long to be remembered. It was at Nice, in the week between Christmas and New Year's that the Unit, on leave for the moment, perfected plans for its return to the ruins in January. It knew well what it faced. Grécourt itself was uninhabitable. There was only one store in all the region, at Roye. Food came in once a week through the army from Amiens. But at least the Unit had more resources than the brave---one might almost say the foolhardy--- villagers, most of whom had staid on in the ruins after the expiration of temporary passes issued so that they might look over their property. In Paris, on the rue de Rivoli, could be seen day after day the long cue of exiles, waiting their turn for those precious permits. Our permits were ready, and on New Year's Day we journeyed again to the Somme. This time, we made a distribution in bulk of blankets and warm clothing through all our villages. Shortly after, three of our number,---all there were room for,---took up temporary quarters at Nesle. There Mme. and M. Vernes of the French Red Cross were already established. Nor did M. Vernes' new title of Délegué au Contrôle de la Somme prevent him from spreading jam on slices of bread and butter for the children's Christmas fete. From Nesle as a base, the country-side was searched to find living quarters. The choice fell upon Lannoy Farm, situated about a mile from Grécourt and placed at our disposal by the Baron de Thézy. Lannoy, in 1917, had been the hospitable goal of many a pleasant walk through the woods and across the fields. Then the Baroness de Thézy welcomed us, muddy as we were, into the gracious drawingroom whlch in former days had looked out over flower gardens and moat to the Baron's level acres. A fire always burned on the hearth, polished furniture and warm-colored upholstery gleamed in its light. There were cows in the stables, and pats of golden butter in the dairy which found their way to our table at Grécourt. Not that Lannoy even then was without its war history. The Baron himself was a hostage; the farm had been occupied by a German commissary detachment whose bold lettering still adorned the massive gate. Its gray quadrangle of barns and stables was already partially destroyed. In 1918, the destruction was completed. Situated on the very edge of the Canal du Nord, it had been a stronghold of the British in the spring, and of the Germans in the fall. French guns, which drove the Germans out, left it a striking ruin. 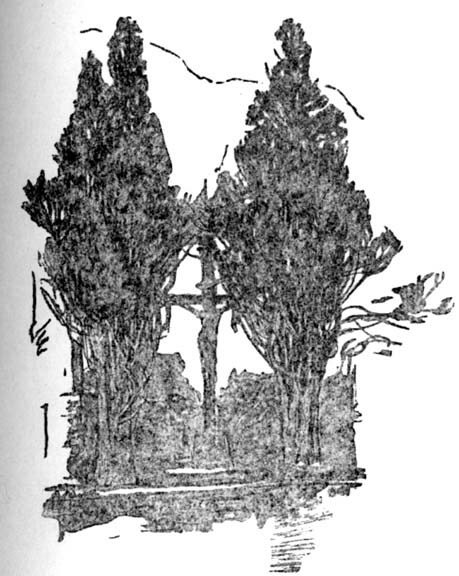 Across the moat, in a newly made cemetery, lay marked with wooden crosses the .graves of British, French, Germans and one American. On two British crosses were the dates: March 25, 1917. In the moat itself was débris of all kinds, including household furniture which the Germans had thrown out. Unexploded ammunition littered the court; a mound of helmets, shells, equipment and wreckage of all kinds rose in the center; the chimneys were mined. But the Unit saw possibilities in some of the rooms which still had four sides, roofs and floors. From the French major at Nesle, they got a detail of twenty-five German prisoners to clean up Lannoy Farm. But had it not been for the girls themselves, that augean task would never have been accomplished. They did not dress in rubber boots, riding breeches and peasants' smocks with any intention of shocking the conservatives--should such have returned---of the Somme. They dressed for their work. Cleaning wells, hauling water, cooking, mending chairs, scrubbing, such was their daily round. And when at last in February Lannoy was filled by the happy and reunited Unit, it was only to serve its turn as a pied à terre for the more augean task of cleaning up Grécourt. For, after an inspection of all the ruins, in all possible places, the Director of the Unit came to the decision that there were no ruins to compare with its ruins. The peasants went back to their own homes, on their own land, whatever their condition. 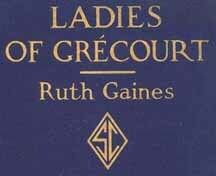 We would go back also, to be in fact as well as in name, the "Ladies of Grécourt." But it was not on the original site that our three baraques, begged from an engineer's dump of our old allies, the Third French Army, were erected. Back of the Baronne's garden was found a field, very muddy in those winter days, but destined with the spring to cherry and apple blossoms in the orchard, and song birds in the coverts of the encircling woods.